My Name is Sarah: How do We BLOG? When Sarah was in kindergarten, I helped out one morning a week in the classroom. The morning ritual involved carpet time where kids would describe what they did the night before. Sarah really struggled with this. One night at home we were sitting on the couch looking at recent pictures and Sarah was talking up a storm. I wondered why she couldn't do this at school? Then it hit me that the difference was the photo. So the next day I put a picture in a plastic sleeve and sent it in with her. The teacher called me after school that day to tell me what a great job Sarah did telling the class about her picture. Then in first grade Sarah did not have much interest in reading the primers the class was working on. 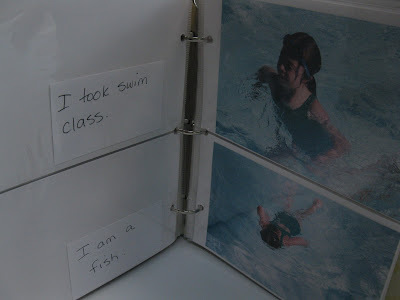 I remembered the difference the photos made in telling a story in kindergarten, so I thought maybe adding words to photos would work. For the first book, I took pictures of things she loved. 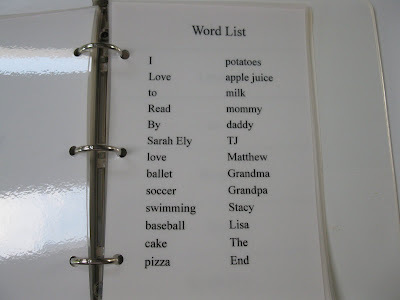 Then I created a word list of all the words in the book. In the back I put an envelope where I put all the words cut up. 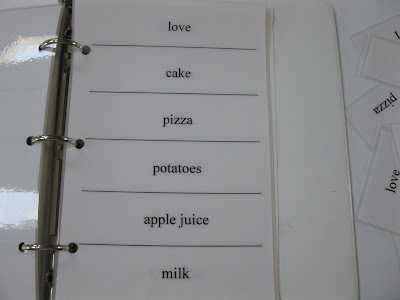 I laminated each page and all the words just so it would last longer. And finally I created pages that had the words that she could match the cut up words on. It was a huge success. 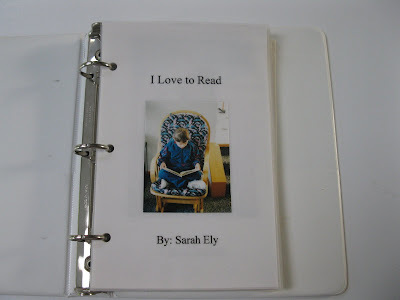 So we created lots of different books all with pictures of Sarah and things in her world. 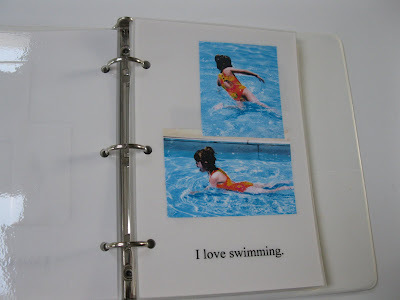 It worked so well the teachers decided to start incorporating photos in the classroom work. 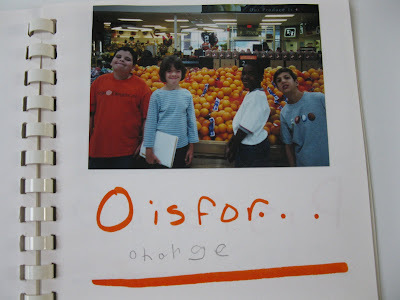 One week they made an A,B,C book on a field trip to the grocery store. By this point Sarah was writing in some of her own words. Then we started making albums over the summer so when school started she could tell the class about what she did over the break. 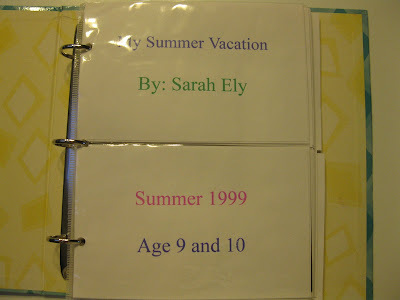 By 1999 typing was a component of her IEP so she started using the computer to type comments for each picture. This is when it really started to be like blogging today. I would ask her about the picture and then write a sentence and stick it into the sleeve of the photo book. Sarah would then type what I had written. Then in 2002, we started getting a little more creative. 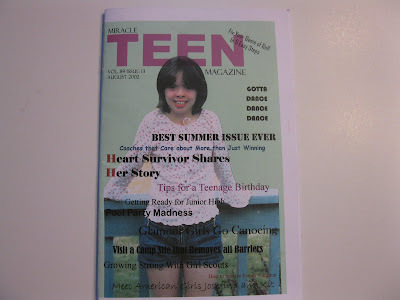 We bought our first color printer with a flat bed copier, so we made a "magazine." Sarah and I would brain storm ideas and then she would type the titles. We would first do a mock up where I would write what she wanted to say. It usually involved a conversation where I would let her pick the pictures she wanted to use and then I would ask her to tell me about them. As she was describing it, I would summarize what she was telling me into words. 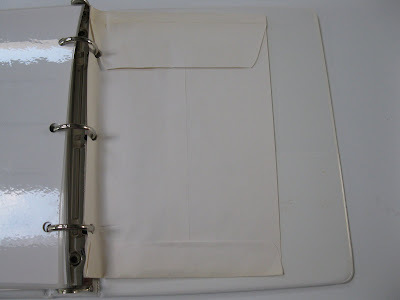 Once she was done, we would make copies for all our relatives and friends and mail them. They would usually then send her a letter a week or so later making comments on her activities. Imagine, the thrill when we discovered internet blogging!!! We use the same process we developed years ago, it is just all electronic and the access for our friends and relatives is instant. Even the comments are instant! Not to mention much less expensive!!! Soon we will show you how she is writing the comments she leaves. I love the explanation! I always tell Addy about all the things she's going to be able to do when she's older like Sarah! Sarah is a wonderful inspiration! Fantastic Joyce! You are such a great mom! Sarah is so lucky to have you! 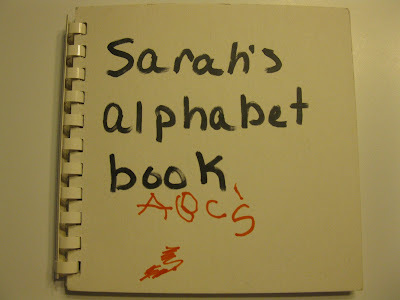 I love the books and all the different ways that you incorporated Sarah into the educational process. She learned sooo much from all this. It's fabulous! Also what great keepsakes for her. You guys are awesome! Such an inspiration! No doubt! Joyce, you are an inspiration. Sarah is an inspiration. I love the books. I will have to do this with Matthew when he's in school. I recently just ordered a laminating machine too so I think it's going to be put to very good use. Thanks for sharing this. Oh my goodness. This is brilliant! Thank you for sharing. I'll be starting this with Carly. She may not talk much, but she is one smart little cookie. Thanks again for sharing. What a great learning tool! Joyce, the fact that you had the foresight to photograph these is a blessing! Joyce, What an innovative idea?! It just shows your love for Sarah. If ever there is an award for 'most wonderful mom', it should definitely go to you. Sarah, you are truly an inspiration. Breaking all the barriers. I so admire both of you. Joyce, you are a wonder and such an amazing, creative, brilliant mom. Thanks for posting this. Can't wait for the next installment. Wow! I'm so impressed. thanks for sharing all that. I'm anxious to hear how Sarah does her comments! I *have* wondered about this, so I was so excited to see this post! And what a TON of great ideas are here! We do a similar picture book, only with single words at this stage, but Braska loves it. I can't wait to see how she grows through the years and we learn whatever is next...after blogging? Is that possible? :) Can't wait to read about the next step. Comments!! Wow Joyce... I am sooo glad you shared this, please keep informing us. You are such a great role model for us mothers of young Ds babies, I truly get so much from you. As Presley gets older I made need you on speed dial!! WOW! That was fantastic! I will do the same for Justin if it works for him! Thanks for the fabulous idea! You guys are amazing.Really amazing.Sarah is amazing and such an inspiration to so many.Do you know how many there are out there saying"I am so going to do that! "Thanks for sharing. Love the header picture Sarah ... you were such a darling baby. What great ideas you had! 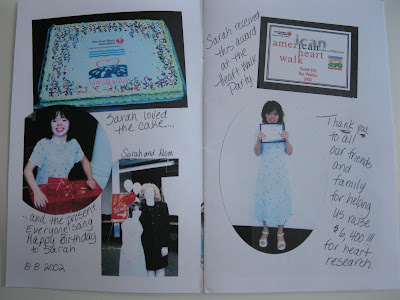 I think it is just great that Sarah blogs! Thanks for sharing all of your ideas! I love how creative you were! I wondered about some of the pictures that you've had and why you would have taken your camera into the hosptial, etc. You're the kind of mom that I strive to be. Wow, you guys have put alot of work into all of that, what a fantastic thing to do. You guys are awesome!!! Thank you for sharing so much creative and genius information! Gabriel is very visual and making his "Going to School" books has had a very satisfying effect for him. I am going to use you ideas to help him be more communicative in school this year! This is brilliant! I need to get a laminator and start working on things like this for Kayla. Thanks so much for the inspiration! I absolutely need a laminator and some of your creative thinking ideas. I love it! You and Sarah are an inspiration in so many ways. Wow that is amazing - thanks for sharing the process with us. Love it. Love all the ideas you just gave. You both do an awesome job blogging. Joyce, this is such a wonderful idea! 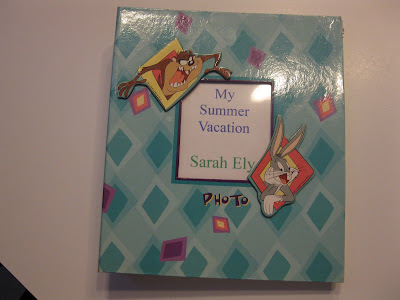 I love reading Sarah's blogs and wil probably use some of the technique when I begin field experiences for my special ed degree!